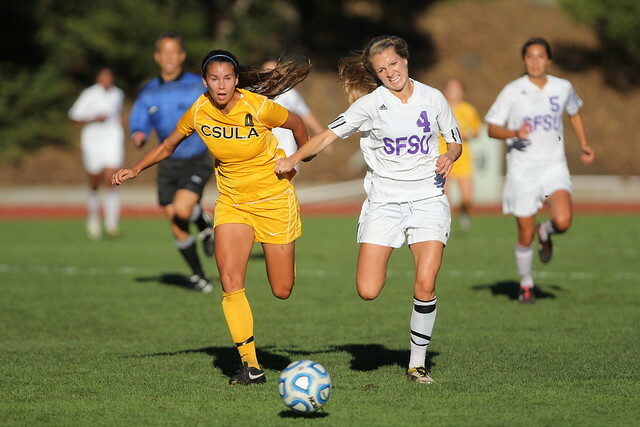 Forward Chloe Harrington (4), right, fights to regain the ball in a game against Cal State Los Angeles at Cox Stadium on Oct. 26, 2012. The Gators tied with the Golden Eagles 1-1 after two rounds of overtime. Photo by Tearsa Joy Hammock / Xpress. Long shadows cast over Cox Stadium as the Gators came out with a 1-1 draw against the Cal State Los Angeles Golden Eagles in an intense double overtime match. The Gators scored in the 17th minute of the first half when Golden Eagle junior Alexandra Barrett-Scherrer headed the ball in over Gator senior goalkeeper Annicia Jones. The Gators came back in the second half after junior forward Michelle Kay slipped in the goal between the legs of Golden Eagle goalkeeper Gabriella Batmani. Assistant coach Robin Bowman said Kay made a nice goal that brought the team back in the game, but it wasn’t enough to win. Although the Gators ended the game with less shots on goal than the Golden Eagles, the Gators had more attempts by one or two shots during both overtime periods. Jones played a huge role in preventing the Golden Eagles from scoring by garnering 14 close saves. Bowman anticipates another tough game this Sunday as the Gators host their last home game of the season against Cal State Dominguez Hills. “(Sunday’s game is) gonna be a battle and it’s the seniors’ last game, so I know that the players will be playing for the two of them,” Bowman said. The match against Dominguez Hills will be the last game for seniors Nicole Vanni and Jones. Kay said she is ready to get revenge after they lost to the Toros 2-1 in their away game against them earlier this month. The Gators will face off with the Toros at 2 p.m. on Oct. 28. Senior athletes from both teams will also be recognized.